My Mom's Modified Shrimp Dip-awesome with a cape! This simple recipe is always a fav. at get together's and has become one my mother gets asked to make repeatedly. It does not last, so if you want extra be prepared to double & triple this recipe because you will end up with an empty bowl. You may also add a bit of hot sauce if you like it more spicy. Alas, my eczema has decided that spiciness shall be no more in my diet, so yam it up for me!This recipe uses Pacific white shrimp, which, from what I have researched is a sustainable seafood, for now. If you should find out differently then please let me know, I like the corrections-just be kind about it. 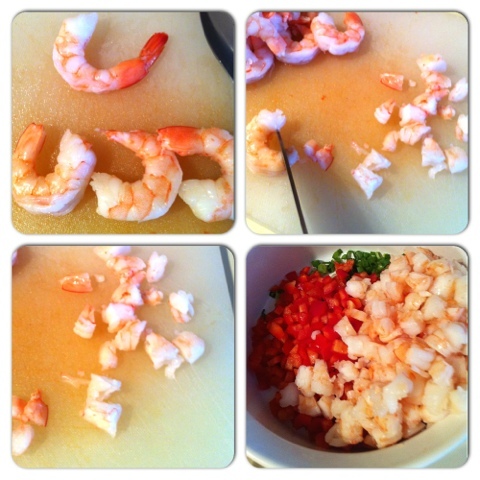 -300g (About 31-40 individual shrimps)Extra large Pacific white shrimp, deveined, cooked, and peeled. sliced thin with the white parts and green. 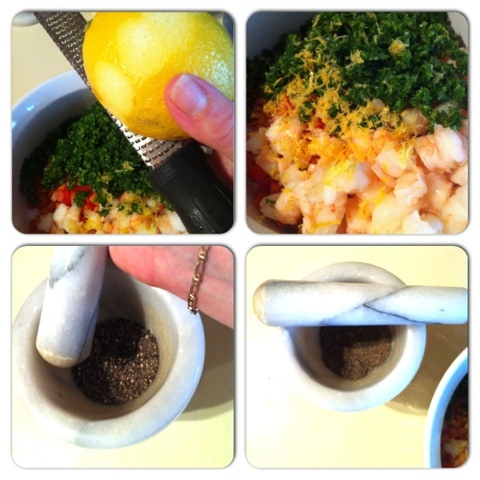 -1 Bunch curly parsley chopped to equal 1/2 of a cup. 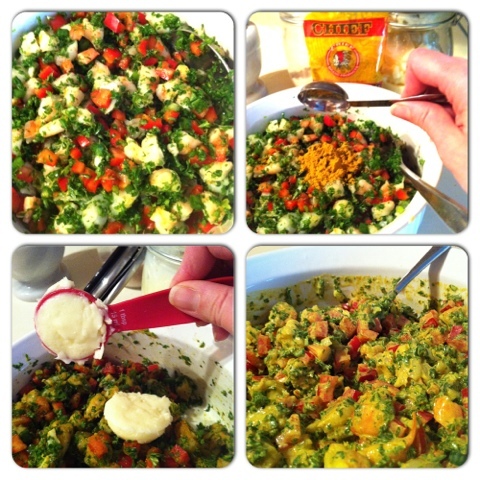 - When all veg and shrimp ingredients are measured and prepped, toss them all together in the bowl and mix well. 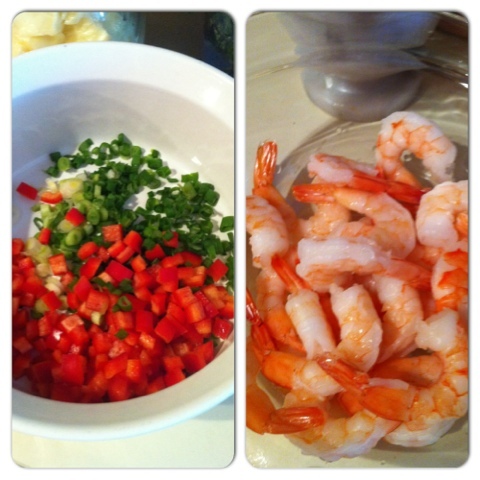 -Add spices and stir through, it will look kind of like shrimp tabbouleh. -Add mayo and yogurt and stir through. Let sit in fridge covered for 2-3 hours and serve on crackers. I used sesame rice crackers. 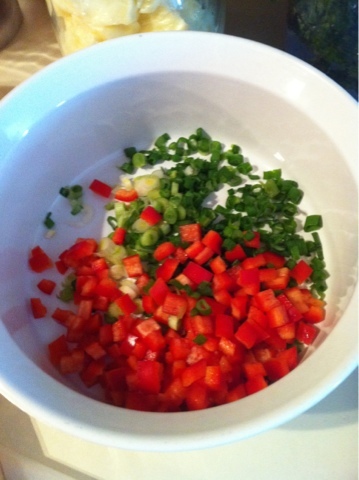 I have included pics below because it is easier to visually see the way to cut, chop, zest, etc. The pictures are in order and show how to get the sizes of what you want for this recipe, without fuss. The peppers are to be cut in strips as shown to achieve the proper dice. 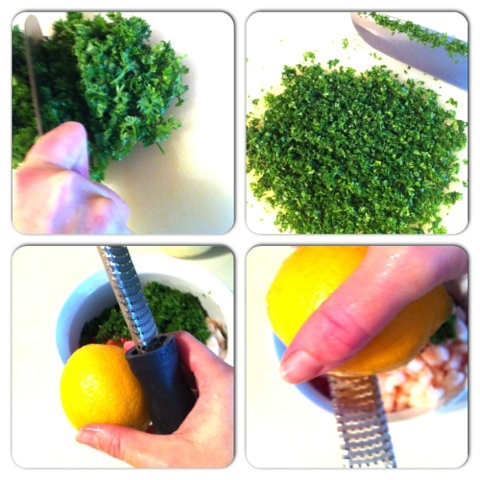 There is also a Chef trick used for parsley, once it has been thoroughly cleaned in cold running water, (make sure no dirt or sand remain or else it will leave grit in your food) Chefs dry it a bit and bunch the parsley all together in a wad, then leave a bit exposed as they chop it; being careful of fingers and hands. 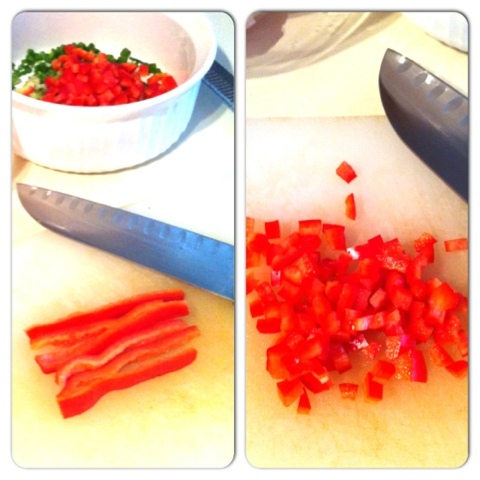 Then they put it on the cutting board and chop back and forth until it's finely chopped. 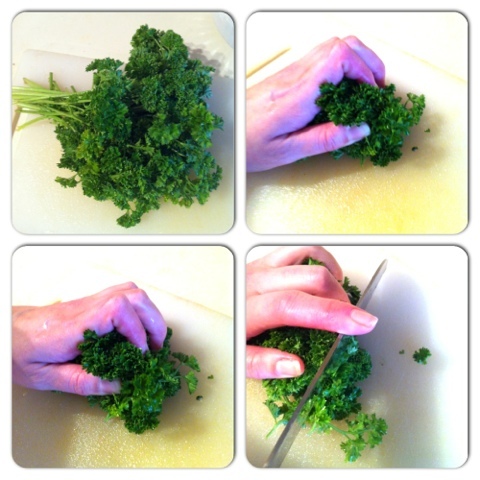 Do not hold your finger on top of the blade as you see in the pic when chopping, ever! I was taking pics one handed and had no choice but to hold it that way. When zesting, I use a microplane zester but a box zester will do. Just be sure to zest only the yellow skin not the white part known as the pith, it's bitter and not appealing. Only the yellow lemon skin part. I also happened to of bought shrimps that had the tails on and I know for some people this can be intimidating. Once you have defrosted them, just peel the end of the tail slowly, beginning where there's a natural indentation in the tail shell. 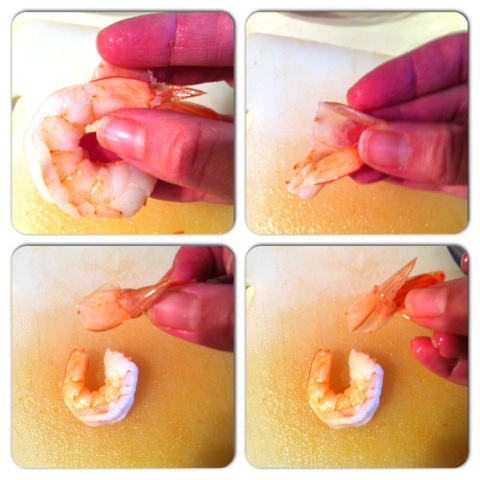 When sufficiently peeled you then pinch the tail off by holding the shrimp with one hand as you peel, or by laying it flat on a cutting board and holding with one hand as you pinch and pull away from the shrimp. You will notice this recipe uses home made mayo, I no longer purchase it because it doesn't taste good to me and I don't like food with ingredients I can't pronounce or with artificial muck. This recipe will follow in another post, I forgot to measure and take pics while I made it for this recipe so when I am out of mayo I will make more and post. In the mayo pics I switch to a plastic spoon for measuring, the reason for this is because non-reactive spoons like plastic or wood will not impart flavour to the mayo and do not cause it to spoil as quickly. 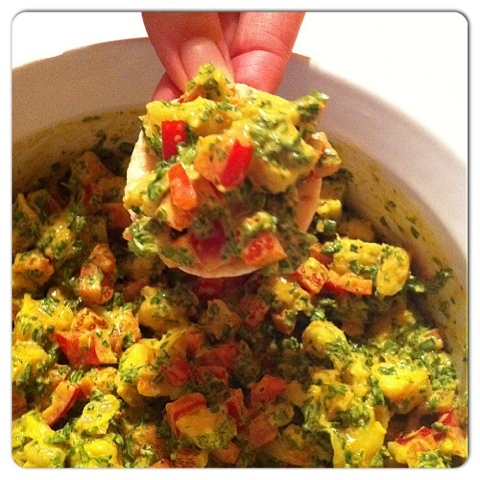 The pictures below are in order, I hope you enjoy this recipe and as always it's gluten free!